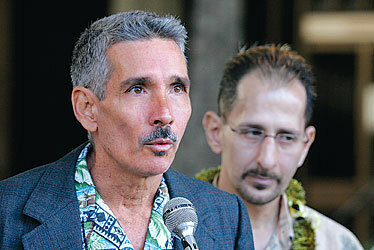 State Rep. Joe Bertram (D, Makena-Kihei), left, talked yesterday about medical marijuana bills he is introducing. Although marijuana for medical purposes is legal in Hawaii, patients authorized to use the plant are being hassled by law enforcement agencies and others, said Maui Rep. Joe Bertram III. The major problem is patient access to marijuana, a gray area in the seven-year-old law, Bertram (D, Makena-Kihei) said yesterday, announcing legislation to "tighten it up with better management." One of his measures (House Bill 2678), being heard today by the House Health Committee, would authorize the state Department of Health to develop a secure growing facility on Maui for medical marijuana. A facilitator would make space available to patients or caregivers for a total of as many as 98 plants at one time. A second bill, HB 2675, would allow a qualified patient to use marijuana for medical purposes with written certification from another state instead of a certificate from Hawaii's Department of Public Safety. Keith Kamita, chief of the state Narcotics Enforcement Division, which administers the medical marijuana law, said a growing facility would violate federal law. Also, because the bill mandates the DOH to control the facility, he said in an interview, "Now it's a state agency sanctioning marijuana. Say there's a bad batch and people die or get sick, the state would be liable for distributing a contaminated product." Marijuana is still a Schedule 1 controlled substance, with no medical use allowed under federal law, and growers would have to obtain a research permit from the federal and state governments, he said. Kamita also noted that more marijuana is showing up in schools, possibly because of its use for medical patients. "Kids can go see Grandpa and go see a harvest. We've just got to be very careful with this." He said the problem with recognizing certification from another state for a person to use medical marijuana is that each state could have different qualifying conditions and rules. Twelve other states have legalized marijuana, he said. "Our main concern is the differences between those states and Hawaii. There would be no way for law enforcement to verify the validity of that certificate (from another state)." As of Wednesday, Kamita said, 4,047 Hawaii patients had received medical marijuana cards, and 368 caregivers and 124 physicians are participating in the program. Joining Bertram at a news conference at the Capitol were Alan Doherty, a Big Island disabled veteran; Joseph Rattner, diagnosed with HIV 15 years ago; and Brian Murphy, executive director, Maui County Citizens for Democracy in Action and Patients Without Time. Doherty, 84, said he comes to Honolulu at times for treatment at Tripler Army Medical Center and brought some marijuana with him on a recent trip because of pain in an injured foot. It was seized at the airport, and six months later Hawaii County prosecutors charged him with transporting a detrimental drug, he said. He received a six-month suspended sentence and is on probation, he said. He said the law restricts use of marijuana to a person's own house. "You can't take it or get it any place. I certainly hope that will be corrected so we can get our medical marijuana without all this hassle." He said county prosecutors and the police "ignore marijuana as a medicine. They consider it to be a detrimental drug. That is a bad misnomer." Rattner, president of West Hawaii Hope for a Cure Foundation, said growing marijuana "is a science in Hawaii," and a seriously ill person is not able to grow his own medicine.